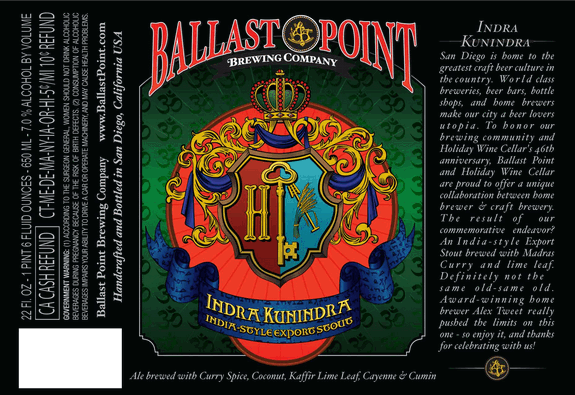 Brewed with madras curry, caynne pepper, cumin, toasted coconut, and kaffir lime leaf, Indra Kunindra is a 9% ABV stout brewed in collaboration with homebrewer Alex Tweet. It was brewed for Holiday Wine Cellar’s 46th Anniversary Homebrewers Competition. First batch at 9%, others at 7%. Even though the light in the bar was less than perfect I was still able to tell that this was a dark beer. 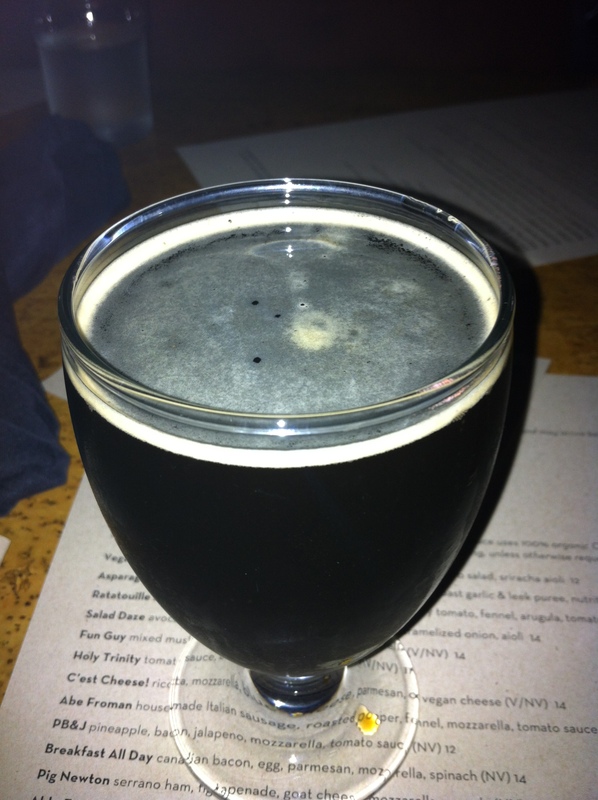 The beer was so black/dark brown that even when I took a picture the flash wasn’t able to penetrate the obsidian liquid. The head was a wisp of recycled-paper brown. I’ve used the term “unique” before to describe a beer, but it is definitely relevant in regards to this beer. I picked up red grapes, dates, cumin, curry, and brown rice scents. Sadly I didn’t get any coconut or lime notes (I technically didn’t even realize there was supposed to be coconut and lime in this beer until I started doing research for this review). This beer literally smells just like Indian food. Whoa, that is spicy! The taste starts off with a sweetness similar to a mixture of black cherry soda, dates, and bubblegum. This is only temporary before my mouth was flooded with a giant blast of curry that hit me in a BIG way. Chocolate comes through at the end to remind you that this is a stout, but it doesn’t do enough to make you forget the spice. As the beer warms up the sweet fruits come through stronger, but the heat never really lets up. Mouthfeel is medium to light with faint carbonation. It dissipates rather quickly, but the spices dominate and cloud your taste buds. Indra Kunindra is a very interesting beer. I love spicy beers, but this was the first time I’ve had one that had Indian spices. The curry was definitely a “unique” touch and it could more easy drinking if the spices were toned down just a hair. All and all it wasn’t too bad.